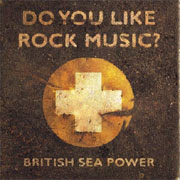 An idiosyncratic band, British Sea Power reach their third album with much of their foibles intact but often threaten to skate off the edge of a cliff here and plunge headfirst into the sea of stadium rock. Don't do it boys! However, there are some very strong tracks on the album and even though they've worked with three different producers on these they've managed to marshall the essential and eccentric chaos that is BSP into a pretty good shape overall. It's most definitely a technicolour, Panavision production that almost contradicts the fussy, introspective subject matter. It's debatable whether their intentions do get lost in the scope of the production and how 'radio-friendly' they intended this to be. The opening 'All In It' with its anthemic chanting doesn't prepare you for the next few tracks. 'Lights Out For Darker Skies', 'No Lucifer' with their cathedral like sonics, choral and guitar treatments, metaphysical (and literal with 'No Lucifer's' Big Daddy tribute) wrestling are respectively epic, aptly windswept and fine surging pop. It's the stadium friendly 'Waving Flags' that has me slightly worried that BSP might get their bearings in a muddle. It's a great song, ripe for audience participation and has a pertinent message about immigration but it eschews a good deal of the bonkers chaos of the first album. Their strangeness does remain intact on the second half of the album and in particular 'Canvey Island' with its doomladen flood warnings and disease ridden swans is a stand out track, but it does all rather become standard jangly guitar indie rock on 'No Need To Cry' and 'Open The Door'. The superb atmospherics of the near instrumental 'The Great Skua' and the apologia for the complexities of particle theory on the quirkily brilliant 'Atom' compensate for these but I still can't fathom the reprise of 'We Close Our Eyes' which is a lame coda of sound effects and the chant from the opener 'All In It'. It's feels too much of a token gesture in order to finish the album off. It's a good album but not a great one. Their are reminders of The Flaming Lips, The Smiths, New Order and some of the epic, whirling production work of Brian Eno and it's an incredibly festival friendly set of songs but I'd have preferred a bit more experimentation. And if they do come across as the British equivalent of Arcade Fire then that's because in the first place they were exploring the same sonic territory before the Fire wholly claimed it and secondly they've then got their ex-drummer co-producing this album. The comparisons are inevitable. If they keep their chaotic nerve and their British peccadilloes intact then I will keep listening. And keep producing album sleeves and liner notes of this quality as this attention to detail and the obvious labour of love that went into contents for this album are generally fast becoming a dying art.